Promote Our Commodities - I've been lucky the last couple of years to have be asked to judge the 4-H Promote Our Commodities contest. This is a cooking and baking contest where 4-Hers bring dishes that feature beef, pork, lamb, dairy or soy. It is always fun to try all the fun recipes the 4-Hers bring and to talk to them about Iowa's top commodities. I hope I continue to be asked to judge this event! LP helping me judge 4-Her Abby's Oatmeal Cranberry Soy Cookies - very delicious! Farm Bureau Burger Feed - Every year the Franklin County Farm Bureau (which both My Farmer and I serve on) sponsors a day at the fair. One thing the Farm Bureau does as a part of that sponsored day is that we have a burger feed. We pass out 1,000 pork burger and hamburgers. It is great way to promote pork, beef and Farm Bureau. at the burger feed. You can see part of the burger feed line behind them. Entertainment - Our County Fair does a great job with an Entertainment line-up every year. 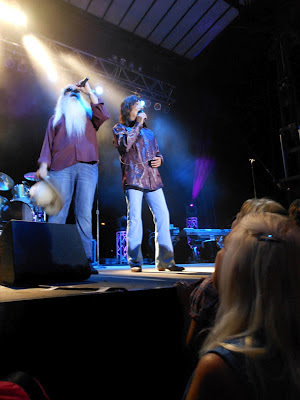 This year we really enjoyed going to the Oak Ridge Boys concert, Rodney Atkins concert and the Monster Truck Rally. My personal favorite was the Oak Ridge Boys concert. My Farmer, LP and I brought my Mom and Grandma along with us to the concert. My Grandma, who will be 80 at the end of the month, is a huge Oak Ridge Boys fan. She had a great time at the concert which made me enjoy it that much more! She stood up near the stage for the concert and got high-fives from the whole band at the end of the night. They played for over an hour and a half and had the entire crowd on their feet. Their final song was Amazing Grace which was dedicated to those in Aurora, Colorado. My Grandma is the one with white shoulder length hair in the bottom right of this photo. You can see how close she got to the stage! Food - You can't talk about the Fair and not talk about FOOD! Every year at our County Fair I have to eat at the 4-H Food Stand and get a taco salad and a slice of homemade pie, I have to get a chicken wrap from the Smoke & Crome stand, and I have to get homemade ice cream from Pleasant Hill. This year my new favorite food I tried was fried cookie dough on a stick! The food at the County Fair makes me excited for food at the State Fair next month! Family Time - We had a blast as a family at the fair this year. LP is only 16 months old but he had so much fun at the fair! He enjoyed just people watching, to singing and dancing at the concerts, to cheering on the Monster Trucks. It was fun to do things as a family all week long. LP loved putting his hands up in the air and cheering at the concerts. Here we all are cheering for the Oak Ridge Boys. I always love hearing from readers. What is your favorite thing to do at the Fair? Fair time favorite is definitely the food! This year for our concert we have Joe Nichols and John Anderson. Should be a good one! Enjoy the food and the concerts Nicole! What a great post, Val! I love the Franklin County Fair, too. My kids had a great first-time experience as 4-H exhibitors. Watching them talk with the judges would be #1 on my Top 5 List. The Rodney Atkins' concert and the rodeo were my favorite grandstand events. We all enjoyed the free tiger show. P.S. I'd like to talk with you about some ways to publicize the Promote Your Commodities competition in 2013. I bet it was a lot of fun having kids in 4-H this year! Yes, I'd love to talk to you about publicizing the Promote Your Commodities competition for next year. Not enough 4-Hers participate!